Foreign Minister Sergey Lavrov held diplomatic talks with Minister of Foreign Affairs and Cooperation of Mozambique Jose Pacheco, who arrived in Moscow on a visit following his participation in the St Petersburg International Economic Forum. The two ministers discussed a whole range of issues related to the further progressive development and strengthening of traditionally friendly Russia-Mozambique relations, including the maintenance of an active political dialogue. Relations have been friendly over the years between Russia and Mozambique. They paid special attention to improving mutually beneficial partnership in various areas with an emphasis on making use of the potential of the Russia-Mozambique Intergovernmental Commission on Economic, Scientific and Technical Cooperation, whose first meeting was held on April 24-25 in Maputo. Foreign Minister of Mozambique Jose Pacheco said that Mozambique plans to sign an agreement with Rosneft and ExxonMobil on gas field exploration in the north of the country by the end of 2018. The plan is to create a consortium with the participation of a Mozambican company, Rosneft and ExxonMobil to develop offshore hydrocarbon fields near Mozambique. “The project to develop gas fields in the north of Mozambique is under discussion now. The plan is to sign an agreement this year and launch the project on field development in Mozambique with participation of Rosneft and ExxonMobil,” the Minister said. “We had an opportunity to speak with Rosneft’s management at the St. Petersburg International Economic Forum 2018, our delegation also included experts in the field, we are actively working and discussing, and are hoping to get a positive result,” Pacheco said. There is an increasing interest of the Russian business community in building a partnership with Mozambique, which matches Maputo’s intention to attract Russian investment and technical assistance. “We have reaffirmed mutual commitment to promoting trade and economic cooperation, and believe that joint efforts in geological exploration and mineral extraction as well as telecommunications, energy and agriculture are the main priorities,” according to Lavrov. There has been a long-standing tradition of Mozambicans receiving a higher education in Russia. While expressing deep satisfaction with the first meeting of the Intergovernmental Commission held in Maputo in late April, Minister Sergey Lavrov pointed to the training of Mozambique specialists at Russian universities in civilian professions and law enforcement officers trained at the educational institutions of the Russian Ministry of Defense and Ministry of the Interior. “We are ready to consider the possibility of increasing the number of students in these areas. 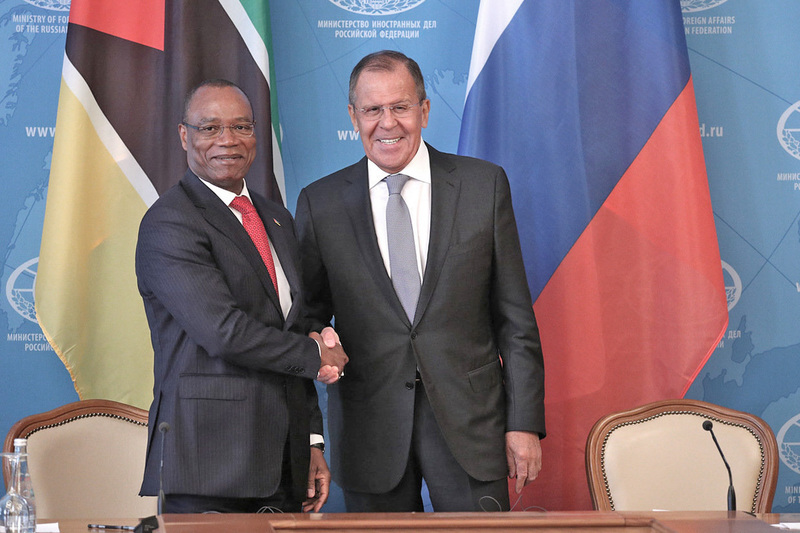 I firmly believe that Russia and Mozambique will achieve new results in its economic and political dialogue as well as in the humanitarian, cultural and education areas,” Lavrov told his visiting colleague in Moscow. The two diplomats also discussed the efficiency of terrorism counteraction, multilateral and sustainable development of Africa and the settlement of internal political crises and armed conflicts on the continent. In fact, at present, Russia’s relations with African countries are progressing both on a bilateral basis and along the line of African regional organisations, primarily the African Union and the Southern African Development Community. Russia’s support for Maputo’s constructive commitment to developing regional integration processes was confirmed, as was its intention to assist the African community in the search for consensus solutions to the challenges facing the continent. In the opinion of Lavrov, Russia and Mozambique have consistently maintained that all problems, conflicts and crises, unfortunately, still remain on this continent, and should be resolved based on the approaches of Africans themselves, of course, with moral, political and material support from the UN and the UN Security Council. Kester Kenn Klomegah filed in this report from Moscow.